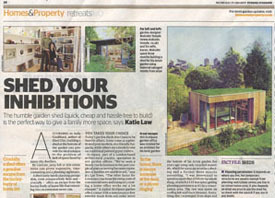 Article content: “The humble garden shed, “quick, cheap and hassle–free to build,it is the perfect way to give a family more space”, says Katie Law. According to Sally Coultard, author of ‘Shed Chic’, building a shed at the bottom of the garden can provide an ideal solution to the problem of lack of space faced by many city dwellers. By contrast, jazzy loft or side extensions can be expensive, time consuming and a planning nightmare. A shed rarely needs planning permission, cost comparatively little and – crucially offers an escape from the hurley–burly of home life that retreating into an extension never can.